This award for Excellence in School Building and Design was awarded for the Mason Preparatory School - Lower School by the South Carolina Chapter of CEFPI. This award for New Construction was awarded for the Mason Preparatory School - Lower School by the AIA Charleston. This award for Excellence in School Building and Design was given for the Oakland Elementary School by the South Carolina Chapter of CEFPI (The Council of Educational Facility Planners). Oakland Elementary school was completed in August of 2010. The Council of Educational Facility Planners (CEFPI) is a professional association whose sole mission is improving the places where children learn. This award for Excellence in School Building and Design was given for the Ashley Hall Media Center and Science Building by the South Carolina Chapter of CEFPI in association with Shepley Bulfinch. This award for Urban Design was presented to the design team by The Southeast Chapter of the Institute of Classical Architecture and Classical America for excellence in traditional and classical design for a Vision of Marion Square in association with Fairfax, Sammons & Partners. This award was for the design of Factors Walk residential project in Charleston, South Carolina presented by the Committee to Save the City. This was a Merit Historic Award for the historic renovation and adaptive reuse of Tiger Lily Florist at Spring and Ashley Streets in Charleston, South Carolina awarded by Charleston Regional Business Journal. Award for renovation and adaptive reuse of 131 Spring Street presented to the firm by the Preservation Society of Charleston. Merit Award for commercial renovation of 34 Radcliffe Street awarded by AIA/Charleston and Charleston Regional Business Journal. The firm was presented a Carolopolis Award for the renovation and adaptive reuse of 34 Radcliffe Street awarded by the Preservation Society of Charleston. One of 6 winners nationally of the Coastal Awards 2000, the firm’s design of the HarbourView Inn received the Award for Contextual Design. 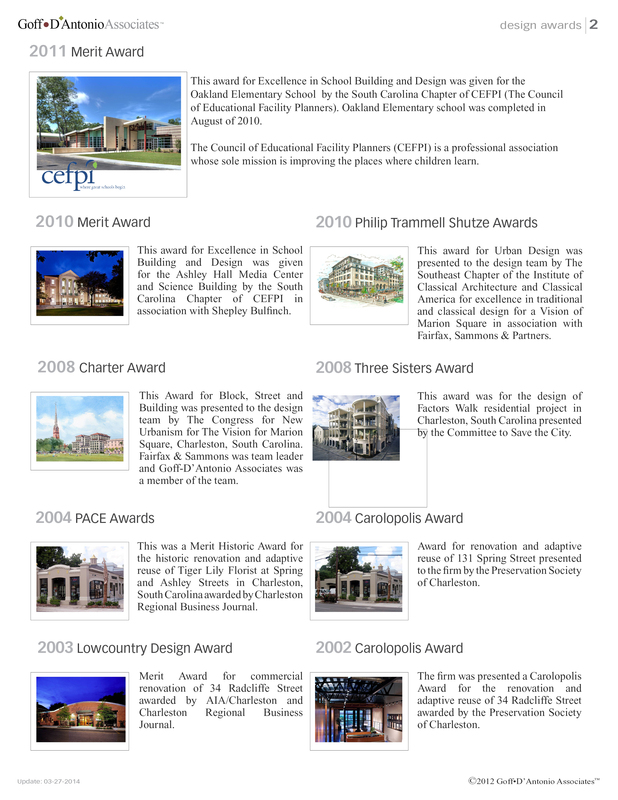 This award recognized projects that were environmentally responsible. The project was published nationally in the January-February 2000 issue of Coastal Living Magazine. The firm was presented with this award for HarbourView Inn by the Preservation Society for preservation and renovation of an historic property. 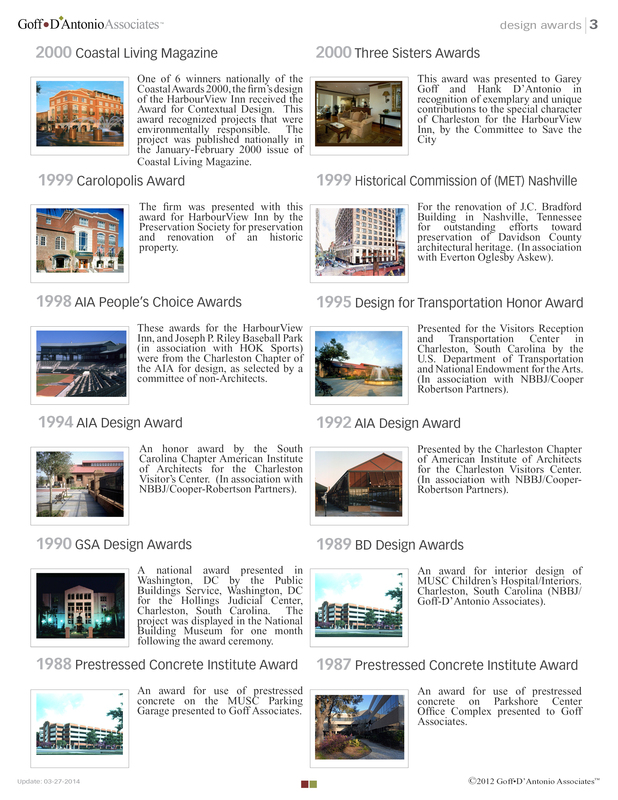 For the renovation of J.C. Bradford Building in Nashville, Tennessee for outstanding efforts toward preservation of Davidson County architectural heritage. (In association with Everton Oglesby Askew). These awards for the HarbourView Inn, and Joseph P. Riley Baseball Park (in association with HOK Sports) were from the Charleston Chapter of the AIA for design, as selected by a committee of non-Architects. Presented for the Visitors Reception and Transportation Center in Charleston, South Carolina by the U.S. Department of Transportation and National Endowment for the Arts. (In association with NBBJ/Cooper Robertson Partners). An honor award by the South Carolina Chapter American Institute of Architects for the Charleston Visitor’s Center. (In association with NBBJ/Cooper-Robertson Partners). 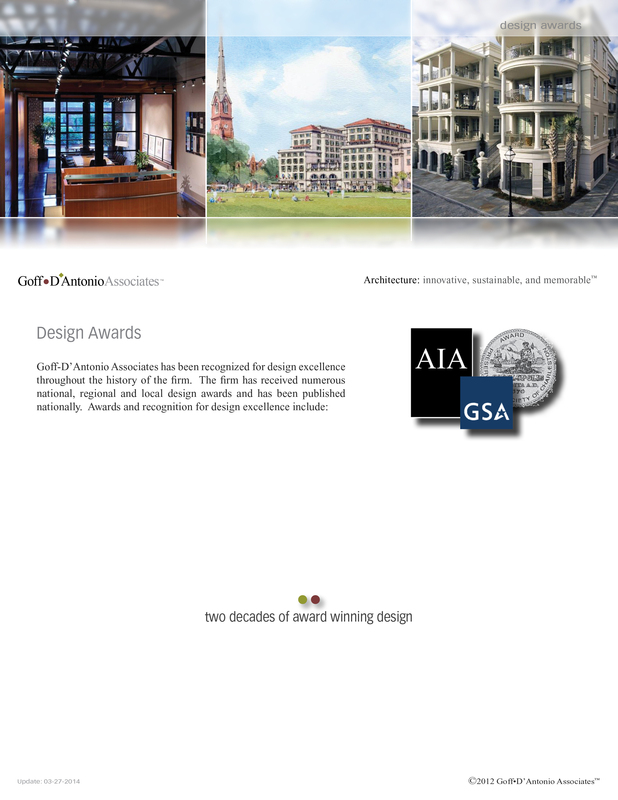 Presented by the Charleston Chapter of American Institute of Architects for the Charleston Visitors Center. (In association with NBBJ/Cooper-Robertson Partners). A national award presented in Washington, DC by the Public Buildings Service, Washington, DC for the Hollings Judicial Center, Charleston, South Carolina. The project was displayed in the National Building Museum for one month following the award ceremony. An award for interior design of MUSC Children’s Hospital/Interiors. Charleston, South Carolina (NBBJ/Goff-D’Antonio Associates). An award for use of prestressed concrete on Parkshore Center Office Complex presented to Goff Associates.